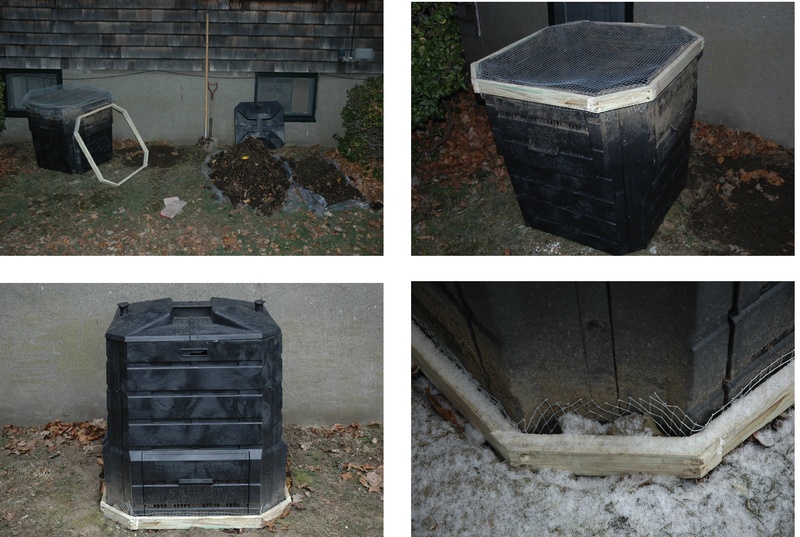 My compost bin sits on the side of my house in Rhode Island. Everything was going smoothly for several months after it was started. Vegetable and fruit matter interspersed with layers of leaves were composting efficiently. My household garbage disposal was minimal, typically about one plastic shopping bag a week, and it was characterized by minimal odor. Like everything in life however, this blissful decomposition sequence was destined to change. The first intrusive sign was a small hole in the ground at the base of the bottom left side of the bin, which was followed shortly by a second hole on the front side of the bin. I assumed that these holes were made by cute, cuddly mice, so I simply plugged them with rocks, and didn’t give it much thought until I started noticing what looked like tunnels in the compost. I did not connect the dots until one day I was greeted by a beady pair of eyes on what I took to be a rat snout. The sturdy tail at the other end seemed to confirm my suspicion. The blissful character of the compost bin was forever changed. It had transformed from a pastoral decomposition site doing nature’s bidding to a rodent breeding ground that was going to be the epicenter of a bubonic plague outbreak. What to do? I was propelled into action a few days after the alleged rat’s appearance, when a half-eaten orange was pulled down one of the tunnels while I was depositing another gourmet meal into what had clearly become a rodent restaurant. After some deliberation, I came up with the idea of placing a subterranean wire mesh fence in a trench around the perimeter of the bin to a depth of at least eight inches. Someone suggested putting dog hair from a local pet groomery in and around the bin, and another suggestion involved plugging the entry holes with steel wool. Fortunately, before implementing any of these plans, I met one of the Worm Ladies (www.wormladies.com) at the Saturday Pawtucket Farmers’ Market (www.farmfreshri.org). She (I’m not sure if it was Nancy or Susie) suggested placing a sheet of wire mesh under the bin, and then bending a few inches of excess around the sides. I had obviously not thought of this scheme because it was totally logical, practical and efficient. A sturdy piece of wire mesh from the local hardwood store and 12 feet of 1x2 inch lumber were purchased. The compost bin was emptied. A piece of the wire mesh was cut so as to extend approximately 3 inches beyond the bin outline on all sides. An octagonal frame was constructed slightly larger than the compost bin so as to provide a tight fit with the folded pieces of the wire mesh. The wire mesh was put in place and secured with the octagonal frame. The bin was situated back in its place on level ground and refilled. Rocks were stuffed into the corners between the frame and the mesh. This was probably unnecessary, but it reflects my obsessive nature. Now, in case any amongst you is intimidated by the precise fitting octagonal frame, please don’t be. That was merely my exuberant addition to exercise some of my languishing carpentry skills. Bending the wire mesh up against the walls of the compost bin and securing it with rocks is perfectly fine. At least three months have passed since the retrofit, and there’s no sign of the furry invaders. Given the fact that we’ve had cold weather, and that the bin provides an extremely enticing meal in a cozy setting, I would like to think that my implementation of the Worm Ladies’ solution is doing the job. Actually unless one of these furry fellows has wire cutters or the wire mesh corrodes completely, I think my bin is off limits. If that changes, I’ll provide an update, but until then, happy composting. The pictures below illustrate the steps outlined above. It actually snowed the day I did this, thereby putting a nice touch on the fresh start.